To receive details on all the latest clearence offers, newest products and business news. 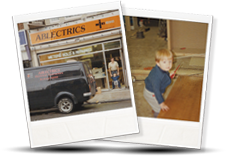 Ablectrics is an electrical wholesalers, lighting showroom & lighting designers based in Bristol. We trade online as electricsandlighting.co.uk. The Business was started in 1974 and we are often described as an institution by our customers because of our unrivalled product knowledge and huge range of stock. It is not unusual for customers to travel across the country to visit our famous showroom and speak to us about their project. So if you are working on your house or business then we are the place to come for inspiration, the latest designs and friendly customer service . We source products and lighting from leading manufacturers all over the world. We have the latest technology in stock and on display in our Bristol lighting showroom. We make our own LED tape and even repair and restore lights in our workshop. Our staff are well trained and we work closly with all the brands we stock. Training is a big part of our job, knowing our products and the regulations means we can afford tecnhincal advise and can recommend products and solutions. You can buy online from us but we would much prefer you came and saw us. Unlike most companies we have chosen to focus on our lighting showroom and the services we offer like our lighting design service. We love the face to face interaction and the rewards of working directly with our customers. As such our showroom is full of luxury lighting and is well worth a visit. If you need a little inspiration then we are the place to come. We are open 6 days a week and are always ready to help. Our award winning service and friendly approach to our work will be a welcome change to buying online. So please come and see us if you need electrics or lighting.